Fort Benning | Saturdays in Columbus? Yes! What are you doing this Saturday? What are you doing this weekend? How often do you think about that early in the week when you don’t have other plans already nailed down? Columbus has a weekend vacation alternative for you during the Winter months that might be surprising. Come on a Friday night and take in a great dinner or a show at one of our local theaters. Do some shopping at our malls and retail stores, or do window shopping with a stroll down Broadway. Then, on Saturday morning, visit Market Days on Broadway, our year-round Saturday morning craft and farmer’s market. Encompassing several blocks, you will find all kinds of things to look at, buy, and bring home! Schedule a local historical and sightseeing tour. Visit one of our great museums. Take a walk along the Riverwalk and the Chattahoochee River. Enjoy a bike ride and some great outdoor fun! 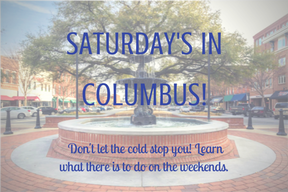 There is absolutely no reason to sit at home on a weekend in the Winter when Columbus is nearby and offers adventure, fun, beauty, access to the outdoor experiences and indoor learning, great food, markets and shopping, music, and so much more! This isn’t meant to be an advertisement. It is an invitation to a great weekend of experiences and enjoyment that is available in a concentrated and accessible area. Check out some of the great Things to Do in Columbus and get started planning your weekend trip!